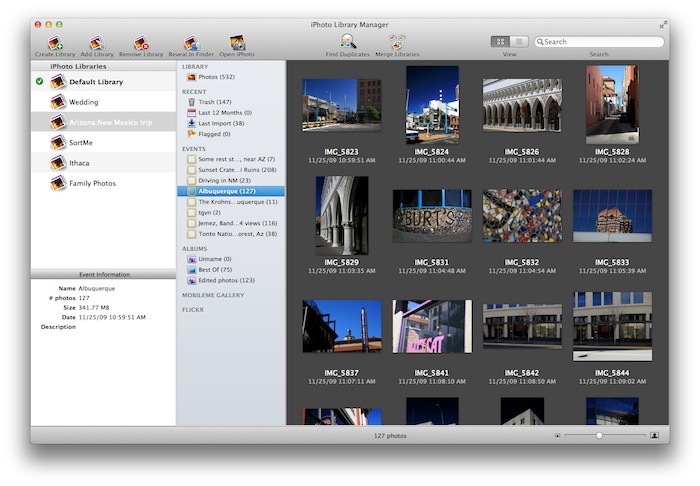 iPhoto Library Manager 4.2.6 – Manage multiple iPhoto libraries and find duplicate photos. iPhoto Library Manager lets you organize your photos into multiple iPhoto libraries. Separate your high school and college photos from your latest summer vacation pictures. Or keep some photo collections on your Mac and others on an external drive. Access only the photos you want, when you want them. Smarter searching. iPhoto Library Manager lets you search for photos across one library or many. You don’t even need to launch iPhoto. Drag-and-drop support. Put everything in its right place by dragging and dropping images from library to library. Nix the dupes. Need to identify and remove duplicate photos across multiple Libraries? iPhoto Library Manager does it quickly and easily. Next story Membrane Pro 1.0.9 – Create your own album artwork. Previous story Chocolat 3.4 – Native Cocoa text editor. iPhoto Library Manager 4.0.9 – Manage multiple iPhoto libraries. iPhoto Library Manager 4.1.9 – Manage multiple iPhoto libraries. iPhoto Library Manager 4.1.4 – Manage multiple iPhoto libraries.